Here's a fun map that doesn't stand up to too much scrutiny, but might be interesting nonetheless. The question: "which places in the United States are as far as you can get from an interstate?" I immediately had to exclude Alaska, as half of the enormous state was further than any other place in the country. Anyways, here are concentric rings drawn around the interstate highway network at 25,000 meter (~15 mile) intervals. At 165 miles from US Highway 85 as the crow flies, Whitewater, Montana, population 448, is the furthest town there is. What city or town wins when you calculate the distances over the roads? 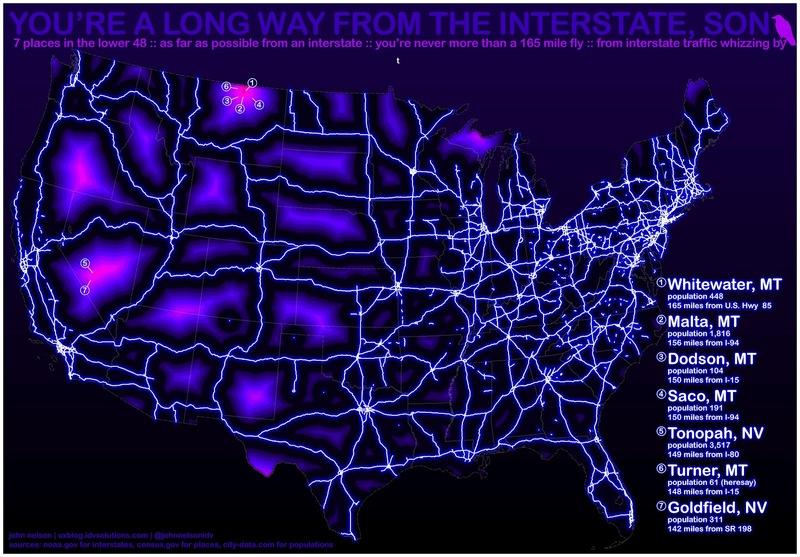 John, great piece of work, but are you plotting divided highways or Interstate highways? If it is Interstates, then why do you have US and state highways listed as Interstates in places such as KY (Hal Rodgers, Combs Mt. Pkwy, Blue Grass Pkwy, 23, 119), VA (460, 60), NC (29, 64, 264), WA (395, 97), ID (20) and CA (101)?